Most Christians and many others believe the Judeo/Christian Bible to be the word of "God." In truth, nearly everything within the Bible was stolen and corrupted from Pagan religions that predated Judeo/Christianity from hundreds to thousands of years, from all around the world, and in particular, the Far East. The Hebrew written "Five Books of Moses" also known as the "Pentateuch", along with the "Torah" were STOLEN and CORRUPTED from the Egyptian "TAROT." Note- "Torah" is an anagram of "Tarot." The most noted example of the Tarot is the 78 card pack sold in many stores now-a-days and used for fortune telling. The Tarot consists of five suits [where the five was stolen and corrupted from]: the wands/rods of fire, the swords of air, the cups of water, the pentacles of earth, and the trump of quintessence/ether. The trump suit was omitted from the standard deck of playing cards, and all that remains of the trump is the Fool card, which was kept as the Joker. All of these are elements [fire, earth, air, water and ether] of the human soul and the message of the Tarot aside from its divination capabilities is the Magnum Opus, which leads to physical and spiritual perfection and immortality. All of this was stolen and corrupted into a fictitious history of the Jews, which has nothing whatsoever to do with spirituality. The Jewish Talmud instructs the Jewish people to destroy Gentiles and enslave them, as "YHVH" in reality is the Jewish people. Sanhedrin 58b. If a heathen [Gentile] hits a Jew, the Gentile must be killed. Hitting a Jew is the same as hitting God. The fictitious Jewish "God" "Yaweh/Jehova's" name was inserted, replacing the names of many Gentile/Pagan Gods. The entity "Jehova" is fictitious. The name "Jehova" was stolen from the Roman God "Jove" for one. The dual aspect of Christianity was stolen from the duality of Zoroastrianism, which preceded the Christian religion by centuries. 3 Yaweh/Jehova replaced Ahura Mazda, and the Old Gods who were the Original Gods [Ahriman, which is Aryan and means "noble" in Sanskrit] were labeled as "evil" in order to establish the supreme monotheism of Yaweh/Jehova. The Original Gods were turned into Demons and monsters which represented evil.4 Most wound up in the "Goetia." Note the similarity of the root "Goet" meaning "Devil" and the derogatory Jewish word for Gentile, which is "Goy" or plural, "Goyim." In the same way the Greeks and Romans may have worshipped their divinities, fondly believing them to be good. But the Christian Scriptures declare that all the gods of the Gentiles are demons. DEMONS ARE THE GODS OF THE GENTILES!!!! The Enuma Elish predated the bible by a minimum of 1,000 years, and is presumed to be much older. The tablets are now in the British Museum. Both of these creation accounts predate Christianity and the Judeo/Christian Bible by centuries. Both reveal there were "GODS" not "One God." Genesis Chapter 1, verse 26 reads: "And God said "let us make man in our image, after our likeness...."
This right here debunks the Jewish monotheistic Yaweh myth. The extra-terrestrial God, known as Ea [Satan] created human beings through genetic engineering, and several other Gods/Goddesses were involved in the creation. See the image of the Sumerian Creation below. This was originally carved in rock, thousands of years old; predating Judeo/Christianity. The Flood Story from Gilgamesh predates the Christian account by well over 1,000 years or more. The Judeo/Christian Bible claims that "Yaweh" incited the flood. In truth, "Enlil" allowed the flood to take place. Tracing Enlil's origins here on earth, we have found he is also known as "Bel" which evolved into the name "Baal" and eventually "Beelzebub" who was God of the Philistines. The "Flood" is another ancient ALLEGORY that was STOLEN and corrupted from the original Pagan religions and has to do with the flood of energy during the working of the Magnum Opus, after which there are visions of colors indicating an important stage has passed. The allegory of the colors is where the Jewish scriptwriters got the "rainbow" and "Jacob's coat of colors" [the aura]. Allegories and CONCEPTS were STOLEN and corrupted into unsavory Jewish characters for Gentiles to slavishly worship. Sacred religious teachings intended for humanity to evolve spiritually were desecrated and replaced with Jewish literary trash. These FICTITIOUS Jewish characters have NOTHING whatsoever to do with spirituality or advancing one's soul. EA warned "ZIUSUDRA" aka "UTNAPISHTIM," not "Noah" about the impending flood and instructed him on building an ark. The legend is Sumerian and Akkadian/Babylonian in origin. The "Atrahasis Epic" is the Akkadian/Babylonian account of the Great Flood. AGAIN, more than one God is involved. Also, the Gods departed from the Earth during the flood. Note "GODS." "Let us go down and there confound their language that they may not understand one another's speech." AGAIN, more than one God is involved. Note the "us." The "Tower of Babel" is another ALLEGORY. In ancient times, humans could communicate telepathically, without words. This was taken from us, but is now becoming a reality again as many of us are experiencing this through the opening of the mind and soul through power meditation. 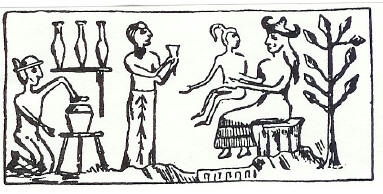 Below is a photo of the basalt stele showing the Sumerian Sun God Shamash giving Hammurabi the tablet listing the laws. "Shamash" is also known as "Azazel," the leader of the so-called "Fallen Angels," the "Igigi" Nordic extra-terrestrials who took human wives. Stolen from the Code of Hammurabi, 3: "If a seignior came forward with false testimony in a case, and has not proved the word which he spoke, if that case was a case involving a life, that seignior shall be put to death." Hammurabi 196: "If a seignior has destroyed the eye of a member of the aristocracy, they shall destroy his eye." Hammurabi 200: "if a seignior has knocked out a tooth of a seignior of his own rank, they shall knock out his tooth." The Ur-Nammu Code is the oldest Ancient Near Eastern law code recovered by archeologists. The Sumerian Code from 1800 BCE belongs to this oldest enduring legal tradition. While Hittite law was similar in many ways to the Hammurabi law codes the “Hittite Code” containing two hundred paragraphs of regulations demonstrates a tolerance for sexual immorality with a strong emphasis upon financial concerns. The Hittites cultivated barley and wheat, brewed a barley beer. Silver pieces were circulated as currency. The Middle Assyrian Code Decreed by Tiglath-Pileser I, Emperor of Assyria from 1115- 1077 BCE. Originally a legal code emphasizing the social concerns and interests of the Assyrian Government. Discovered in 1903 at Ashur in Iraq. Written in Cuneiform on 15 baked clay tablets. Numerous laws in the biblical books of Exodus, Deuteronomy and Leviticus have been stolen from The Assyrian Code. Ahiqar was an advisor to Sennacherib, king of Assyria from 704-681 BCE. In 1906 German archaeologists excavated a copy of his teachings, inscribed upon eleven sheets of palimpsest papyrus, from the debris of Elephantine which is today part of the city of Aswan in Southern Egypt. Amen-em-opet, son of Ka-nakht, taught in Egypt between 1200 - 1000 BCE. The text is found in British Museum Papyrus 10474 and a portion on a writing tablet in Turin, Italy. The papyrus is said to have come from Thebes and is speculated to be of the 10th and 6th centuries BCE. Pay attention and listen to the sayings of the wise; apply your heart to what I teach, for it is pleasing when you keep them in your heart and have all of them ready on your lips. That they may be a key in they heart." And against overbearing the disabled." If your enemy is hungry, give him food to eat; if he is thirsty give him water to drink. In doing this, you will heap burning coals on his head and the Lord will reward you. So that he may be sated and may be ashamed." Do not move and ancient boundry stone or encroach on the fields of the fatherless, for their Defender is strong; he will take up their case against you. Nor encroach upon the boundaries of a widow." Than five thousand taken illegally." Nor hurt thy own heart thereby"
"The mouthful of bread too great thou swallowest and vomitest up." Man knows not what the morrow is like." Another is that which God does." Have I not written thirty sayings for you, sayings of counsel and knowledge. They are the foremost of all books." Ptah-Hotep taught around 2450 BCE, during the 5th Dynasty of The Old Kingdom of Egypt. His teachings were preserved on both clay tablets and papyrus sheets and are presently at the Bibliothéque Nationale in Paris. In addition to the book of Proverbs, many of the writings in the books of Ecclesiastes and Sirach were also stolen from the Teachings of Ptah-Hotep. The Egyptian Love Songs are 1,000+ years older than those in the Song of Solomon. The parallels are unmistakable. The Papyrus Harris 500 was discovered at Thebes in the Ramesseum Complex in the Karnak Temple. Both the biblical books of "Kings" and "Daniel" echo the scenario of entertaining a king along with the prediction of his downfall. The theme of the slave who would be king is repeated in "The Story of Hagar [Genesis chapters 16 and 21]. The Visions of Nefertiti dates back to the reign of the Pharaoh Snefru [2680- 2565 BCE]. He calls for Nefertiti to entertain him. Nefertiti predicts the downfall of the Old Kingdom and the establishment of a new Dynasty by Amen-em-het I [1991- 1786 BCE]. Also, most of what was written in the biblical books of Exodus, Leviticus and Deuteronomy was taken from the above- NOT from "Yaweh." There are xians who are stupid enough to believe their "Yaweh" is the only god. "No Gods before me." The Story of Joseph and Potipher's wife; Genesis Chapter 39. STOLEN from The Story of Anubis and Bata [Egyptian in origin]. The Hymn to the Aton can be found in the Tomb of Eye. 1365- 1348 BCE. Inscribed upon six clay tablets, in the Ugaritic Language; cuneiform script. Circa 1400 BCE. Here is the original story of Job, written in the Ugaritic language [Cuneiform Script], composed circa 1400 BCE by "Ilimilku The Scribe." This epic involves "Keret" and the God "El." NOT Job and jehova. Keret's family tradgedies and illness are comparable with the story of Job. In the original tale, "Satan" never even entered into the picture. As we can see from the above, the Christian "religion" is based upon stolen material that has been twisted, warped and distorted to manipulate, confuse and incite fear into humanity. It has taken the ORIGINAL GOD AND CREATOR OF HUMANITY EA/ENKI aka SATAN/LUCIFER and turned him into an assumed enemy of humanity. "We shall destroy God" -- The Protocols of the Learned Elders of Zion. Christianity has been used to blaspheme, ridicule and malign the Old Gods, create estrangement and enmity from legitimate dieties of which it replaced with the false god "Yaweh/Jehova." In addition, this monstrous program is used as a tool to create a defenseless mentality; that of a slave, to psychologically disarm the Gentile populace into accepting communism, another Jewish brotherhood program. It is often said that the true evil cannot create anything. Everything of the true evil is artificial. In truth, "God" and the "Devil" are backwards. This foul religion's entire foundation is composed of stolen material. In addition, it is anti-life and suicidal. There is nothing at all spiritual about it. The purpose of all of this is to completely cut humanity off from the true Creator God who is Satan. In doing so, the reptilian aliens and those who are working for them will achieve the goal of enslaving the human race through the Jewish program of communism. Satan gives us knowledge and power. Without him, humanity has nothing. The true evil is also known as the master of lies and deception. What greater deception is there for followers of these religious scams to curse and blaspheme their own Creator? Many of the ancient Pagan religions such as the Greeks and the Romans shared legends and pantheons. This is entirely different from Christianity, that has worked relentlessly and brutally to destroy any and all other religions, claiming it to be the only true one. "IN THE SECRET OF MY KNOWLEDGE THERE IS NO GOD BUT ME"
From "Peace Be Unto Him"
2 The Stairway to Heaven by Zecharia Sitchin, page 99. 6 Mesopotamia by Pamela F. Service, page 44.